I am not the type to pair fruit with something savory – but I am starting to come around (I have a meal planned this week that has a mango relish!). And this strawberry salsa was quite surprising. I had a feeling I was going to like it though – cherry tomatoes are so flavorful right now – and with the addition of balsamic vinegar – I knew this was going to taste good. My husband wasn’t home when I ate it – but I had the leftovers ready for him and he was also leery of the strawberries. But he loved it as well!! Definitely a meal that looks really impressive – but super simple to make! Enjoy! 1. Preheat broiler on low. Line baking sheet with foil and spray with olive oil spray. Place salmon fillets on sheet. 2. Squeeze fresh lemon juice onto tops of each fillet and generously season each with salt and pepper. 3. Broil on low to desired doneness, about 10 minutes dependent upon thickness of fillets or until fish reaches 130 degrees in the thickest part. 4. 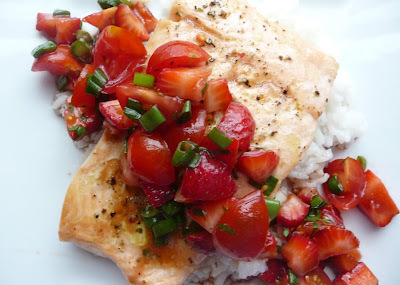 In a medium bowl, combine strawberries, tomatoes, scallions, parsley, vinegars, lemon juice, olive oil, honey, salt and pepper. 5. 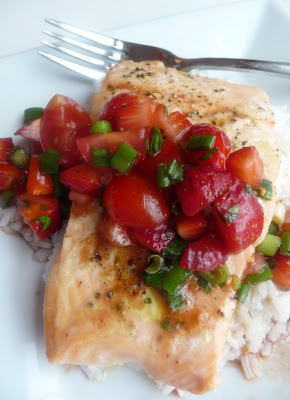 Serve salmon on top of rice and cover with salsa. this was savory goodness. At first when Christine said "Strawberry Salsa" I was WTF! So i tried a little out of the bowl, and thought "hmm this is all right." When placed on the salmon the tastes came together amazingly! really enjoyed it.